The summer here in Lod's Old City area kicked off in the Ottoman period Khan Khilu, where we hosted a Ramadan-themed "Shuk Laila" (night market) bringing together our neighborhood's many communities. One of our newest vendors (pictured above) beautifully described the unique energy of the event, "full of anticipation, looking forward, and joining in celebration." Support for women "without status"
None of this would be possible without so many partners' dedication to this unique neighborhood and city. As we continue to work closely with the Lod Municipality, and Mosaic: Lod Multicultural Center, the coming months promise even greater success. Best regards from all of us here in Lod, and wishing all our supporters and friends many celebrations of their own in the days ahead. Designed to strengthen the connection between apartment complex tenants and Mosaic: Lod Multicultural Center, to provide a culture and recreation opportunity for the neighborhood, and to set a precedent for future community activities of its kind, the Struma street block party drew hundreds of residents to the complex shared yard. Dozens of familes from nearby buildings came for the entertainment including a local performer, music, dancing and a film shown on a big screen. This event built on the success of last year’s gathering at the Hashmonaim complex a few blocks away, but had the additional excitement of falling after dark and the nightly breaking of the traditional Ramadan fast. Organizers used this opportunity to connect with residents, gather contact information, and continue building their neighbohood network. Jindas is one step closer to opening a catering social business which will employ over 30 local women from Lod’s Old City neighborhoods. Working in close partnership with AJEEC-NISPED, the Jindas Center for Business and Entrepreneurship is adapting a model proven successful in the village of Hura, near Beer Sheva, and MigdalHa’Emek in northern Israel. Visits to these sites with potential partners in the initiative provided an exciting preview of what is to come. The caterer will produce thousands of balanced, high quality packaged meals for a range of customers every day. Pictured here, visitors to the MigdalHa’emek caterer learn about the high quality packaging used to keep foods warm and fresh over longer periods of time. A Ramadan-themed night market, the fifth in an ongoing series of “Shuk Laila,” fell the evening before the first fast day of the month-long holiday. Jindas partnered with Lod’s Arab Muslim communities, Mosaic: Lod Multicultural Center, and the Municipality to celebrate the start of Ramadan with traditional foods, music and crafts. Sara Fanta previously lived in central Lod and recently moved with her husband to the Ramat Eshkol neighborhood beside the Old City. She identifies as a member of the local Jewish and Ethiopian communities and is in her second year of a degree program in social work at Ashkelon College. Sara self-funds her education by working as a sales representative for a meat packing company based in Lod and, as part of her degree practicum, joined the Jindas team in September 2015 as an organizer in Mosaic: Lod Multicultural Center, across the street from the Jindas offices. Doaa Zabarqa- A social work student at Ashkelon College, Duaa was born in Lod to a Bedouin family originally from the Negev region. Duaa identifies as a feminist and social activist and regularly volunteers throughout her home neighborhood of Ramat Eshkol, beside Lod’s Old City. As part of her degree practicum, Duaa joined the Jindas team in September 2015 as an organizer working out of Mosaic: Lod’s Multicultural Center, across the street from the Jindas offices. In February, Doaa Zabarqa launched a program for women without status, residents of the West Bank or Gaza who married and started families within Israel but lack official documentation. These women and their children face challenges related to employment, school matriculation, social acceptance, and others. Along with her engagement of program participants, Doaa organized a small conference in April 2016 to raise awareness about these issues. Nearly 100 people attended, including sitting Member of Knesset, Tamar Zandberg, and representatives of the Lod City Council. “We didn’t know so many people would come,” Doaa says. “I sent a message to our group’s Whatsapp and immediately started receiving calls from our local area, and as far as the Negev and even the Galilee. There was a lot of interest.” Each week Doaa meets with a core group of over 20 local women and invites presenters from various organizations to join. 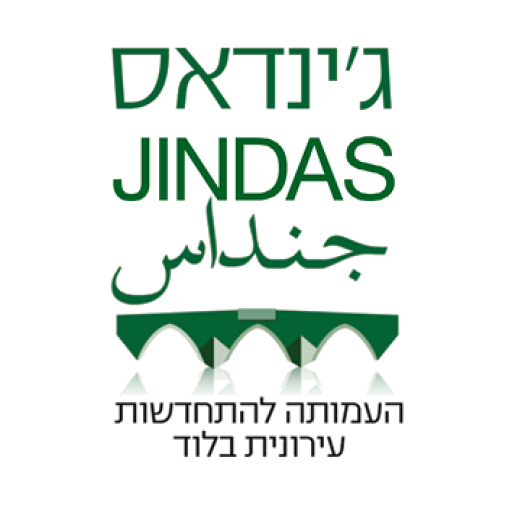 This coming September 19-27, Jindas CEO, Avital Blonder, will travel with a small delegation including Fatten Alzinaty, Director of Mosaic: Lod’s Multicultural Center, and Municipality of Lod General Director, Aharon Attias, to the United States to explore successful urban regeneration initiatives and share the progress of various local initiatives with potential partners there. The delegation will land first in St. Louis, MO to visit affordable housing sites developed by the firm McCormack Baron Salazar, and continue through Washington, DC, Baltimore, MD, and New York City. Building on the already strong partnership between the Municipality, Jindas, and Mosaic, delegation members look forward to bringing new knowledge of best practices and models for advancing urban regeneration back to Lod.